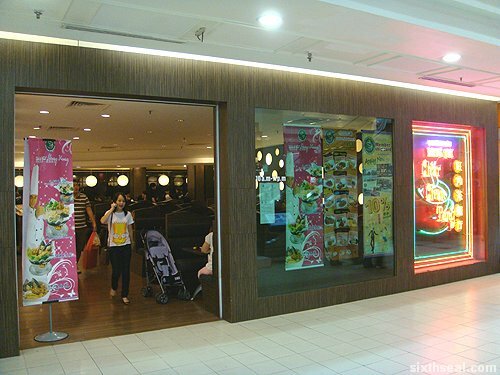 Wong Kok Hong Kong Restaurant is nestled in a quiet alcove in 1 Utama and features a warm ambiance with a heavy emphasis on diffused spot lighting. I did not attempt to count the incandescent spot light fixtures both embedded into the walls and in stand alone lantern style versions but I can assure you that there are quite a lot of them. 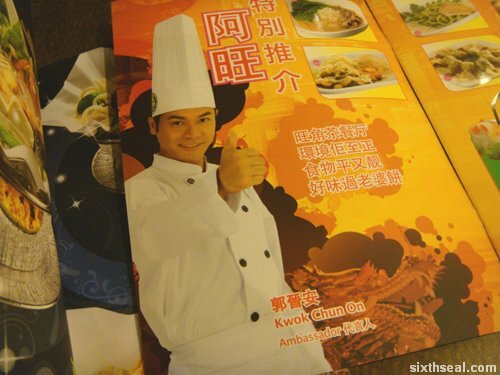 This restaurant is apparently endorsed by a Mr. Kwok Chun On – a pretty boy chef with a forced smile and a unenthusiastic thumbs up. It comes with a lot of Chinese characters on the side, which I can’t read, but I gather he’s the establishment’s ambassador for a reason. 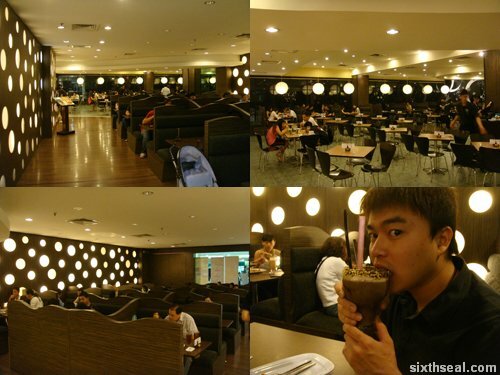 Doris had the Salted Lemon Sourplum Juice (RM 6.80) while I had the Chocolate ice-cream milk shake (RM 7.50). Salt with sour bases makes it sweet so her drink is quite pleasantly saccharine. 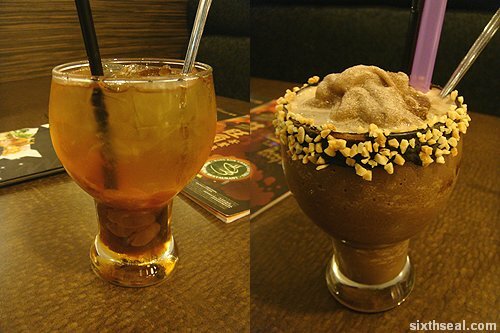 The latter is coated with chocolate and crushed peanuts on the side of the glass, much like a frozen margarita is lined with salt. This is the Shanghai sauce roasted pork with mixed vegetables and rice (RM 9.50) which Doris ordered. It looks a little bit on the plain side, but it tastes good. 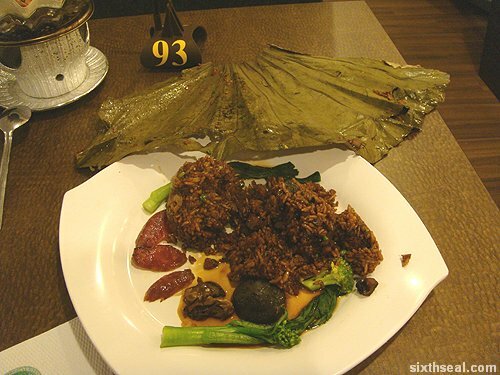 I had the interestingly named Hong Kong waxed meat rice wrapped with lotus leaves (RM 9.50). Doris reads Chinese and told me this is a bak chang of sorts. I love the way it came out though – it’s like a tall, slim pyramid that’s almost phallic in nature. It unwraps to reveal glutenous rice marinated in soy sauce with little treasures of pork, mushrooms and other ingredients inside the rice. 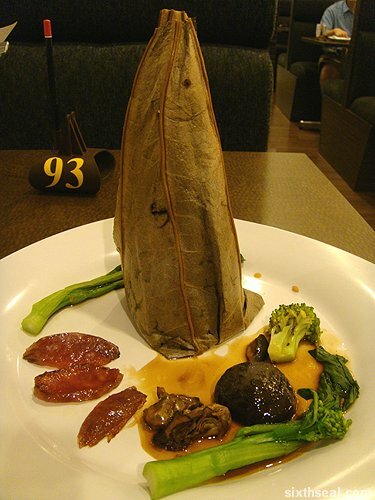 It’s served with Taiwan sausages and a complete shiitake mushroom on the side. It tasted pretty good, and it’s novel. We also ordered French Toast (RM 4.20) – it would be heresy to not check out the quality of the French Toast in a HK eating establishment. 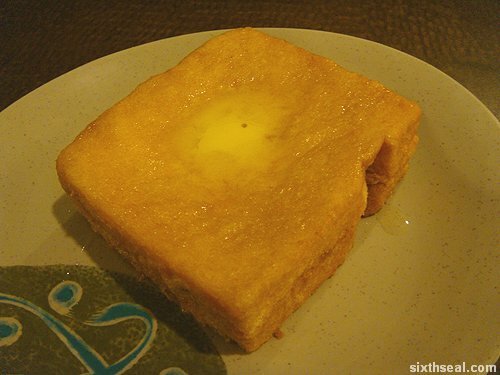 HK style French Toast has peanut butter inside and is deep fried with batter before a slab of artery clogging butter is put on top. 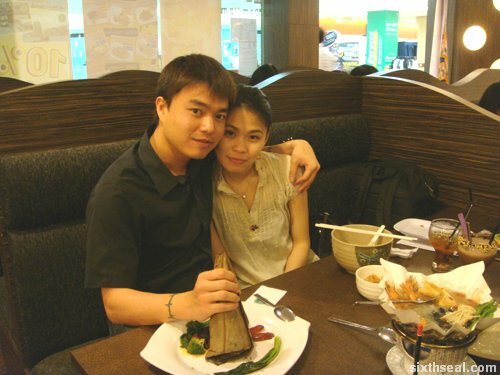 I found Kim Gary’s French Toast to be much better than the Mongkok Teahouse version. 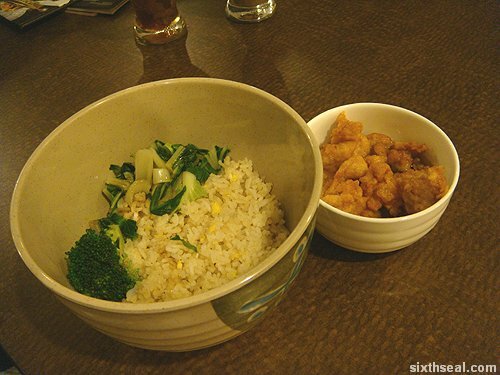 Mongkok Teahouse also has a premium menu – this is the Seafood and Vegetable in Paper Pot (RM 21.80) which we ordered from that menu. 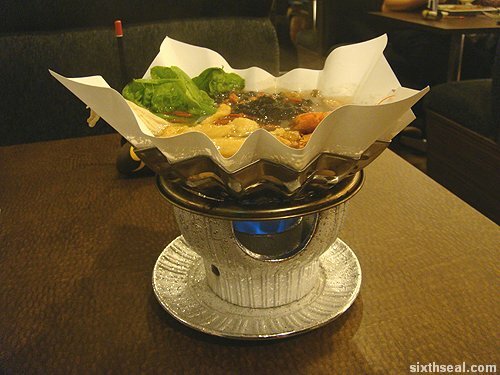 It seems to be one of their signature dishes from the prominent placement on it’s premium menu and comes simmering to your table courtesy of a small boiler beneath the pot. 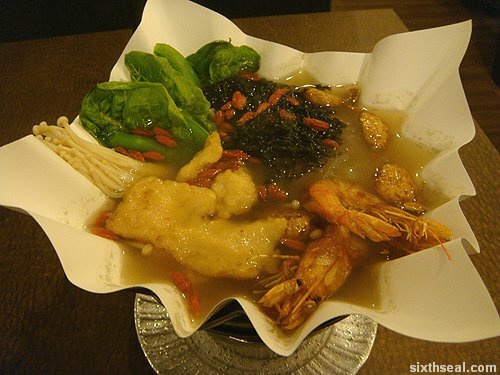 The Seafood and Vegetable in Paper Pot is filled with prawns, fish, seaweed, rice vermicelli and other Chinese herbs and vegetables. It tasted rather bland and we both felt it wasn’t worth the premium price tag. 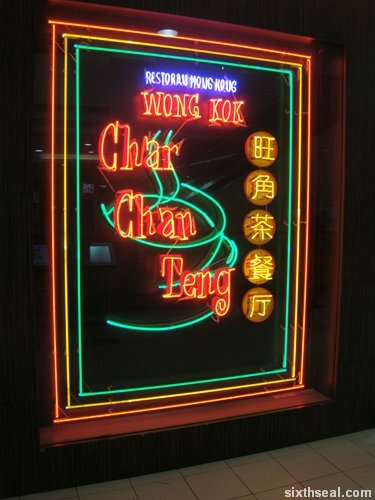 Wong Kok Char Chang Teng Hong Kong Restaurant is one of the less popular HK style eatery chains out there but it’s worth checking out the phallic Hong Kong waxed meat rice wrapped with lotus leaves.